The Hotel in Carrigart, County Donegal is an iconic building that dominates the village where I grew up. It was an integral part of our young lives as we originally lived in what was an extension of the building and we later moved across the street. The red-roofed structure in this picture was our barn, to the rear of our ‘new’ house. There have been many reincarnations of postcards of the village in the heart of a tourist area, but very few feature this beautiful building, the probable reason being that the bend in the main and only street, means it is not possible to capture the entire village in one shot. This photograph was among my late father’s most treasured possessions. I believe it was taken in the early 1950s when the premises was owned by Dermot Walsh. It shows distinctive round steps leading to the main door, a petrol pump and behind it, Walsh’s Bar with Walsh’s shop attached. The bar and shop had separate entrances as can be seen in the photo. I think that the cars are Ford Prefects (any correction most welcome) and would have been crank started. (My Dad owned one of these cars – ours had the registration number of ZL 108.) I particularly like the bicycle in this picture, cleverly and securely parked by placing one of the pedals on the footpath! At that time this petrol pump was the only petrol pump in the village, although Griffins added one in later years. It was situated in an enclosed gravel area and sometimes for a dare we would run through here. Obviously it was an area that was for some reason out-of-bounds for small people, otherwise we would not have bothered! The petrol pump was operated by a big lever so that the person ‘dispensing’ the petrol had to work hard cranking away until the proper volume of petrol was delivered. My father often told the story of the day an important visitor to the nearby and very posh Rosapenna Hotel stopped by for petrol. He had one of the biggest cars ever seen in the locality. The visitor left the engine running and went into the hotel while the car was being filled up. A small crowd gathered while James Boyce cranked away furiously. After some time, the visitor returned to find that James, in spite of cranking away like mad, had not yet managed to fill the tank. He turned to the visitor and said: ‘She’s bating (beating) us so she is, she’s bating us’, meaning that because the engine was running, petrol was being used as fast as it was being pumped in! In reality it was because the tank was so big, it took ages to fill it! I have great memories of happy times spent around the hotel…hours spent with Maggie Greer who single-handed did all the laundry. I loved standing with her in the wash-house that smelled of suds as the sheets swirled round in the big washing machines. I went with her to the clothes line where she hung them out on the long lines with her poor gnarled hands. I loved to see all those sheets billowing and flapping in the breeze! I spent more hours with her as she did the ironing, expertly smoothing and folding each sheet into rectangles as though they had just come new from the shop. To my mother’s annoyance, I also spent time with Tommy Gavigan who bottled the Guinness for the hotel. The huge wooden Guinness barrels lay on their side and he pushed a tap into them from where he filled each bottle. It was then placed on a machine to be capped and I helped him wet and stick on the labels. In return he would cut a sliver off his block of Plug tobacco for me to chew. It is easy to understand why my mother was not too happy to have a 7-year-old chewing tobacco! Tommy also took care of the cows and did the milking in the byre on his little three-legged stool with a metal bucket to catch the warm milk. Afterwards, he might throw me up on top of a cow to sit on her back as she went back out to the field. The Carrigart Hotel has stood on this site for over 100 years. It was built by Michael Friel in about 1910, although he had a smaller hotel prior to this. According to the 1911 Census the hotel boasted 64 rooms with 28 windows to the front and 18 outhouses that included piggeries,stables and a harness room. On Census night, in addition to Michael Friel’s wife and family there were 8 boarders on the premises, including a Dr MacCloskey the local doctor, cooks, servants and a lace instructress! The rather grainy photograph above was taken sometime before the 1930s. The name ‘Friel’s Family & Commercial Hotel’ is attached to the railings that run along the roof. I do not recall these railings or the rooftop ornamentation. In 1934 ownership of the hotel passed to Miss Mary Anne McGuire, who was the sister-in-law of Dr Mac Closkey, recorded as a boarder in 1911 census. Subsequently the hotel passed into the hands of the Walsh Family who operated it until it was sold on again in recent years. The photo in my Dad’s possession evoked lots of pleasant memories for him, just as indeed it does for me. It is a pity that the hotel is no longer in use, but it is still a place for gatherings in the village, still a place where good memories are made, memories that hopefully will last as long as the pleasant memories I have, and that my father before me had, of this lovely building. Mulroy Drive website posted this picture taken in 1951 on the hotel steps. 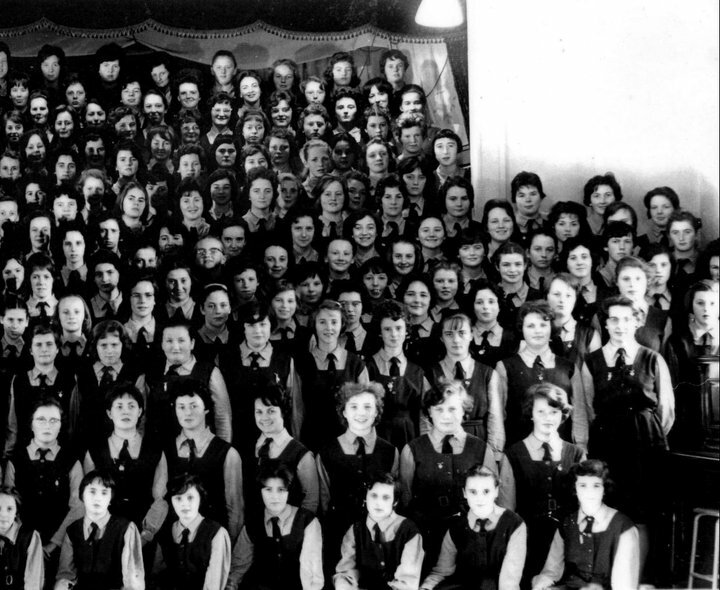 Agnes Duffy McCahill recalls the occasion and listed the names via Eileen McDevitt. Thanks Agnes! Eileen Mc Devitt That photo was taken the Sunday evening that Frank Sweeney who worked in the Carrigart Hotel left to get married to Bridie O Donoghue who worked in Griffins shop. He was waiting for the bus that left Carrigart to go to Letterkenny at 4.50 pm. In June 2011, I put the name ‘Eithne’ and a slightly unusual surname into a search on Facebook. Two pages were returned – one person from Belfast was not who I was looking for, but the second one showed promise. And so I emailed – ”Are you the person who was with me at the St Louis Convent Boarding school in Dundalk, Co Louth, Ireland?” And back came the response – ”Yes, I am ! ” This was one of the amazing moments I have enjoyed since becoming ‘e-inclusive’ as the EU likes to call it! Imagine! Finding someone who was a very special part of my life almost 5 decades ago! Eithne hails from County Monaghan, a county bordering Northern Ireland to the south, and I was from County Donegal, a county that also borders Northern Ireland to the north-west, so we already had something in common! 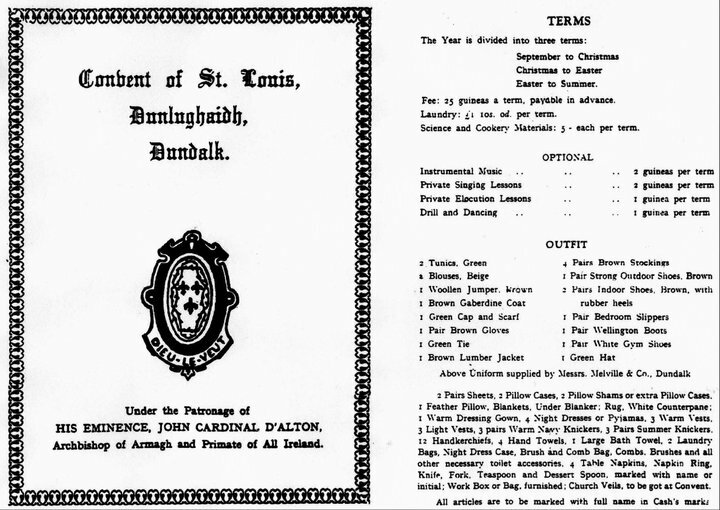 We two Ulster women found ourselves deposited as 13 year olds in a convent boarding school run by the St. Louis Sisters in Dundalk Co Louth – many miles from Eithne’s Castleblayney home and even more from mine in faraway Carrigart, County Donegal. It was 1961. Boarding school had serious disadvantages – nights of lonely crying into the pillow as we faced into three terms of endless weeks missing family and friends and home; months of rising at 7 am; months of cold water for washing ‘everywhere two skins meet’; months of seemingly endless study; months of endless praying. Add to the mix: no boys ; no privacy as only curtains separated our ‘alcove’ sleeping spaces – each containing a single bed, a chair, a locker with a towel rail topped by a green plastic basin and beaker, as well as a single wardrobe. This was ‘home’ for up to 14 or 16 weeks at a time, three times a year, for 5 long years. School was defined by rules, long silences, prayers, study, long regimented walks, retreats, breaking rules, operas, dance lessons, still no boys, even more study, hours of silence, tuck shop on Saturday with Toffo de Luxe and chocolate; mashed parsnips, and first Sundays of each month in silence for up to 17 hours! Here we learned life long skills in the art of sharing: how to divide a three week old quarter sandwich into five portions with the tail of a steel comb; how to dissect a small chocolate Turkish delight sweet into 6 minuscule portions so everyone could share the last remaining morsel of luxury; how to eat a chocolate cake so that only crumbs remained, then pen a letter of complaint to the manufacturer returning the crumbs, stating that it tasted of petrol. The plan worked sometimes and we got a replacement cake! The demands on teenage hormonal girls were truly extraordinary, and – it has to be said – were also character forming. There was one huge advantage: friendships that formed in these adverse conditions ran deep and true. 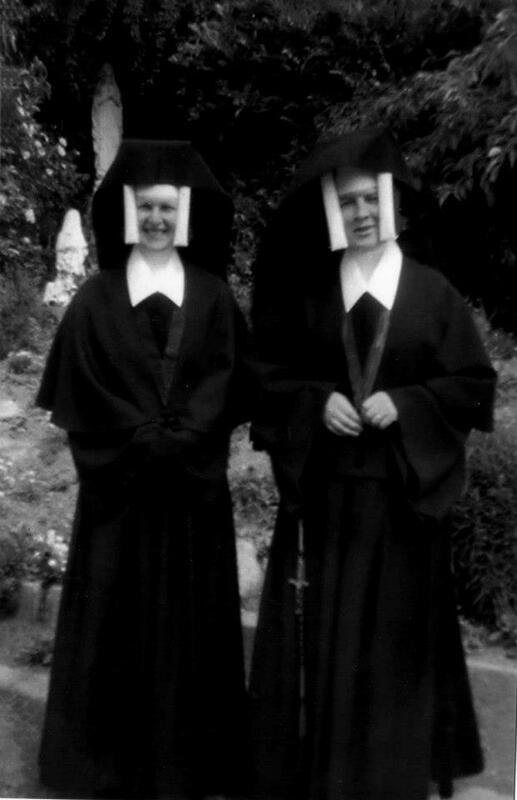 A couple of St Louis Nuns – the delightful Sr Colmcille on left. Eithne and I spent happy summer holidays at each others homes in Donegal and Monaghan. Her home was so exotic – she lived in a fairly large inland town compared to my small village, her family had a shop and a pub no less – and her mother was just the nicest woman ever you met! There was a very beautiful lake nearby where we talked and we walked, lay in the sun and eyed up the local talent. On visits to Donegal, Eithne fitted into our lives like a hand into a glove, and here too we eyed up the local talent and walked and talked on our big deserted beaches. Sadly Eithne changed schools in 1964 when she left to go to school elsewhere, while I remained in the Louis for a further 2 years. Life continued to send us in different directions – in Eithne’s case she emigrated, became a nurse, married and moved between England , Scotland and Holland. In my case I also emigrated to England and with many changes of address we drifted apart. A lifetime later Eithne, after the Facebook search, was coming to Ireland for a visit and so we arranged to meet for lunch last summer! It was with a mixture of excitement and trepidation that I boarded the bus – what would we talk about? Would we have ANYTHING to talk about? What if lunch is just too long? As I approached the meeting point I saw her….later I was intrigued that I had recognized her from the back, as she was facing away from me, but there was something so familiar about her standing there, as though I had seen her just a few days before. I called her name and she turned round…. And so it was – lunch stretched to almost 4 hours of non stop banter and reminiscing. Life stories were recounted including births marriages and deaths of family members we each knew well. We looked back with a great sense of fun at the quite severe existence we endured in the Louis, and how we laughed as we recalled the fun we had when rules were being broken. Life has certainly thrown some challenges to both of us in the intervening 48 years, but we have survived. I am thrilled to have sent that email, to have rediscovered a friend, to discover that true friendship is enduring and can pick up where it left off, no matter how many decades have passed! I rediscovered a kind, gentle, caring person with a lovely sense of humour – what more could a friend wish for ? Thanks Eithne, so glad to be able to call you ‘friend’!